Please read the documentationg page about QoS settings for background information on available support in ROS 2. In this demo, we will spawn a node that publishes a camera image and another that subscribes to the image and shows it on the screen. We will then simulate a lossy network connection between them and show how different quality of service settings handle the bad link. Simply download the binary packages for your OS from the installation page. 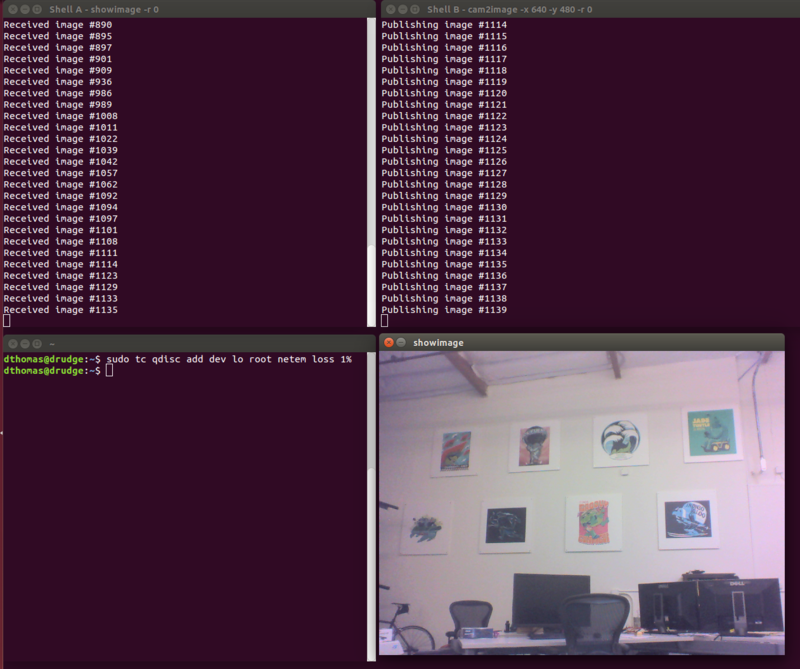 OpenCV is a prerequisite for the QoS demo. See the OpenCV documentation for installation instructions. Follow the instructions on the installation page for your particular platform. Before running the demo, make sure you have a working webcam connected to your computer. Nothing will happen yet. showimage is a subscriber node that is waiting for a publisher on the image topic. Note: you have to close the showimage process with Ctrl-C later. You can’t just close the window. This will publish an image from your webcam. In case you don’t have a camera attached to your computer, there is a commandline option which publishes predefined images. You’ll see a list of the possible options you can pass to the demo. -r: Reliability. There are two options for this policy: reliable or best effort. Reliable means that values may be reset and the underlying DDS publisher might block, in order for messages to get delivered in order. Best effort means that messages will get sent as is, and they may get dropped or lost without effecting the behavior of the publisher. -k: History policy (the “k” stands for “keep”). Determines how DDS buffers messages in the time between the user code that called publish and the time when the message actually gets sent. There are two options for history: KEEP_ALL and KEEP_LAST. KEEP_ALL will buffer all messages before they get sent. KEEP_LAST limits the number of buffered messages to a depth specified by the user. -d: Queue depth. Only used if the history policy is set to KEEP_LAST. The queue depth determines the maximum number of not yet received messages that get buffered on the sender’s side before messages start getting dropped. -s: Toggle displaying the input camera stream. If you run cam2image -s by itself, you’ll see a camera window. If you also run showimage, you’ll see two camera windows. -x and -y: Set the size of the camera feed (x sets the width, y sets the height). The default quality of service settings are tuned for maximum reliability: the reliability policy is reliable, and the history policy is “keep all”. It’s worth noting that both ends must have the same reliability settings for this to work. If the consumer requires the publisher to be reliable, DDS will not match them and there won’t be any exchange between them. We won’t see much of a difference if we change the quality of service settings, since the publisher and subscriber are passing messages over inter-process communication, and messages are unlikely to get dropped if they are travelling within the same machine. This section of the demo won’t work on RTI’s Connext DDS. When running multiple nodes in the same host, the RTI Connext implementation uses shared memory along with the loopback interface. Degrading the loopback interface throughput won’t affect shared memory, thus traffic between the two nodes won’t be affected. See RMW implementation code and RTI Connext Documentation for further reference. This next section is Linux-specific. However, for OS X and Windows you can achieve a similar effect with the utilities “Network Link Conditioner” (part of the xcode tool suite) and “Clumsy” (http://jagt.github.io/clumsy/index.html), respectively, but they will not be covered in this tutorial. We are going to use the Linux network traffic control utility, tc (http://linux.die.net/man/8/tc). This magical incantation will simulate 5% packet loss over the local loopback device. If you use a higher resolution of the images (e.g. -x 640 -y 480) you might want to try a lower packet loss rate (e.g. 1%). Next we start the cam2image and showimage, and we’ll soon notice that both programs seem to have slowed down the rate at which images are transmitted. This is caused by the behavior of the default QoS settings. Enforcing reliability on a lossy channel means that the publisher (in this case, cam2image) will resend the network packets until it receives acknowledgement from the consumer (i.e. showimage).